At last my kitchen is gone through the very last transformation from being "ugly duckling" to becoming the beautiful swan as known from the famous HC Andersen's fairytale "The Ugly Duckling". I was really happy about the completely :-) The final result is just as I had imagined it would be, maybe even better in reality than in my imagination. 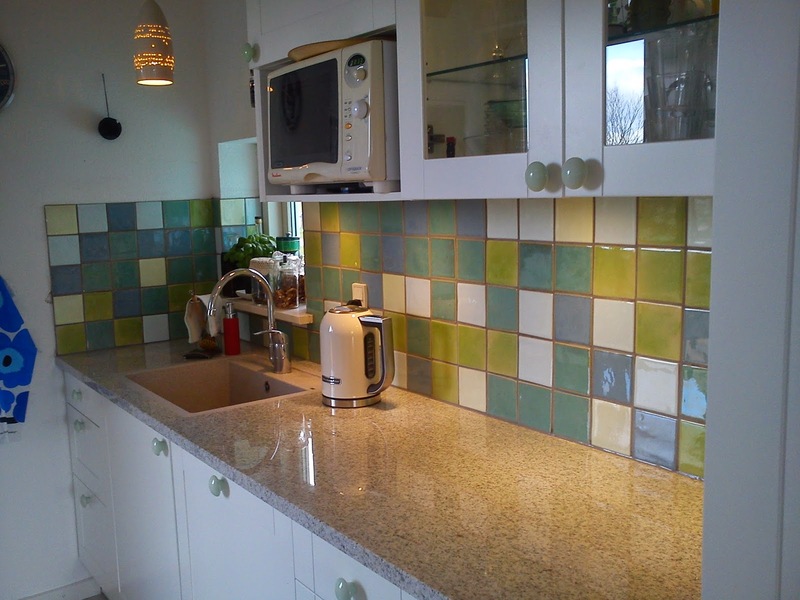 A total of 140 ceramic tiles in five different colors have been putted up in a Marimekko-style mosaik pattern The tiles are made of ceramic artist Dorthe Hansen, and it took her about 2 months to make my tiles after Christmas time and it´s present related orders were all done. 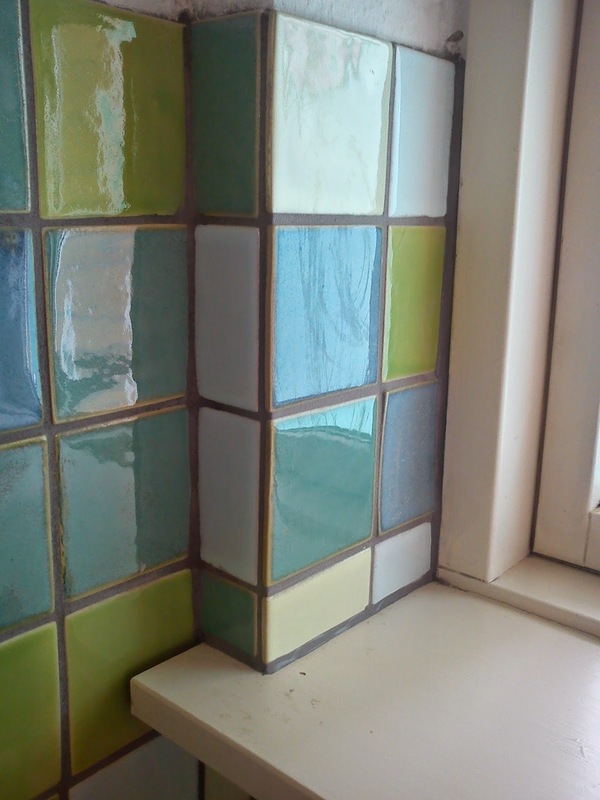 Each tile in 10x10 cm costs 29 kr / each. When I made the agreement with the bricklayer, I asked specifically about an experienced bricklayer, who would be interested in an exciting and challenging task. And this demand of mine was met ! 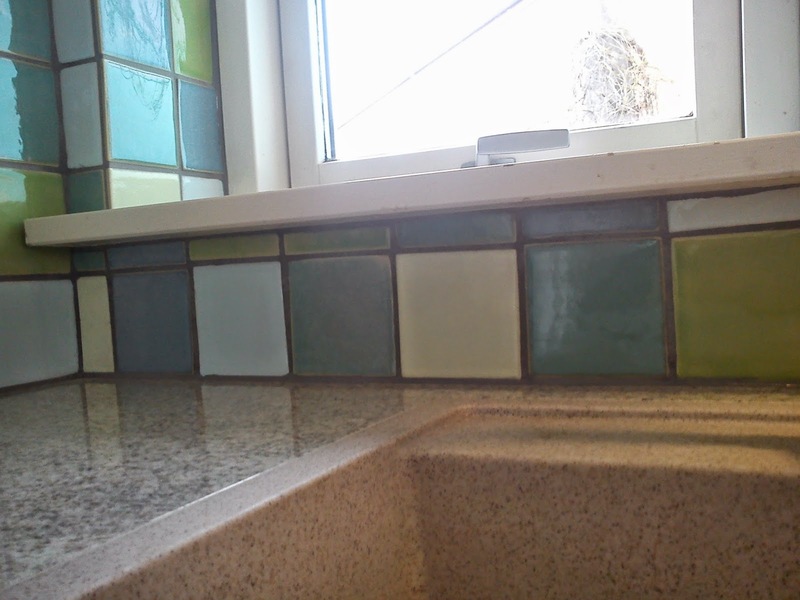 Even the difficult places around the window is performed perfectly with both half and quarter tiles. The tiles in itself is not a standard item, so there was variation in the size between each tile of 2 mm. Despite this, the bricklayer has manages to keep straight lines. Endelige har mit køkken gennemgået den allersidste forvandling fra at være "grim" ælling til at være den flotte svane som i det kendte H.C. Andersens eventyr "Den grimme ælling". Jeg er blevet rigtig glad for det helt færdige køkken :-)Det endelig resultat er ligesom jeg havde forestillet mig, at det ville være, måske endda endnu bedre i virkelighed end i min forestillingsevne. Der er blevet opsat 140 stk keramikfliser i fem forskellige farver i Marimekko inspireret mosaik mønster. Fliserne er fremstillet af keramiker Dorthe Hansen, og det tog cirka 2 måneder for hende at lave mine fliser efter, at julen og gavebestillingerne var overstået. Hver fliser i 10x10 cm koster 29 kr/stk. Da jeg lavet aftalen om opsætningen af fliserne med mureren, så bad jeg specifikt om en erfaren murersvend, som ville være interesseret i en spændende og udfordrende arbejdsopgave. Og det ønske fik jeg opfyldt ! Selv det vanskelige steder omkring vinduet er udførte perfekt med både halve og kvarte fliser. Fliserne i sig selv er ikke en standard vare, så der var variation i størrelsen imellem hver enkel flise på 2 mm. Til trods herfor, så har murersvenden fået opsat fliserne i lige linjer. 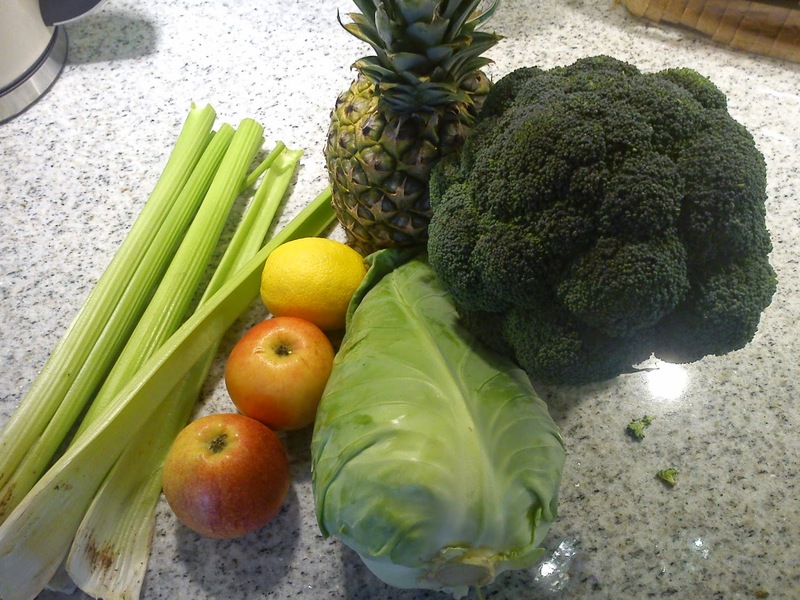 Again I have been looking with great interest in the weekly vegetable box, as it is the JuiceSelvKasse this week. I rotate my weekly vegetable boxes. I have selected four different vegetable boxes, so I received a certain vegetable every forth week. This ENERGIZER both looks and well as tastes very healthy. Using the entire lemon with the peel on brings a bitter note to the juice. So if you are no fan of bitterness, you should consider to use the lemon after removal of the peel. Clean and rinse all the ingredients. Store remaining juice in the refrigerator. 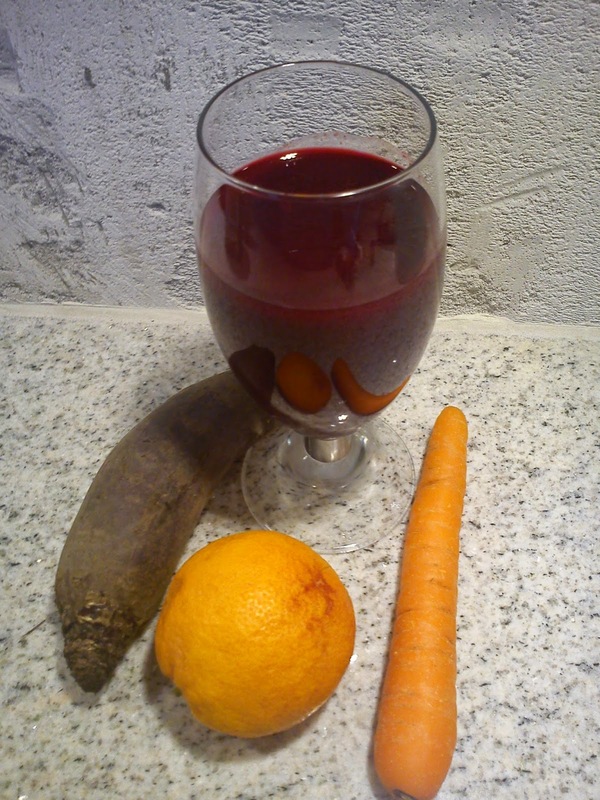 I can feel quiet energised, when I drinking juice containing red beet. The most important thing, when making juice with red beet is to use small size of red beets, as they have less of the "earth" taste, which is not a too nice flavour in my opinion. A knit top for the Summer of 2015 ? I have found a knitting recipe on a Summer top in free knit magazine. In the original recipe the yarn was a mixture of cotton, silk and nylon. Reading the word nylon did not make me happy, as I have preference for natural material. So I took the knit recipe with me to a yarn shop (Stof og Sy) to get their help in locating a more natural yarn for me. 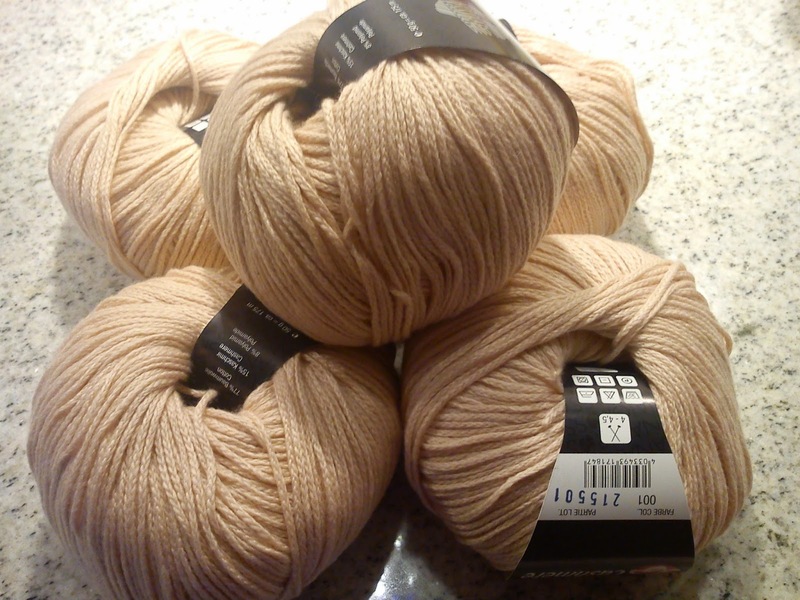 I decided to use 365 Cashmere (cotton, Cashmere & polyamide) instead of. As colour I went for light rosa. The big question is, if my knitting process will result in a knit top for use in the Summer of 2015 or perhaps later on ? 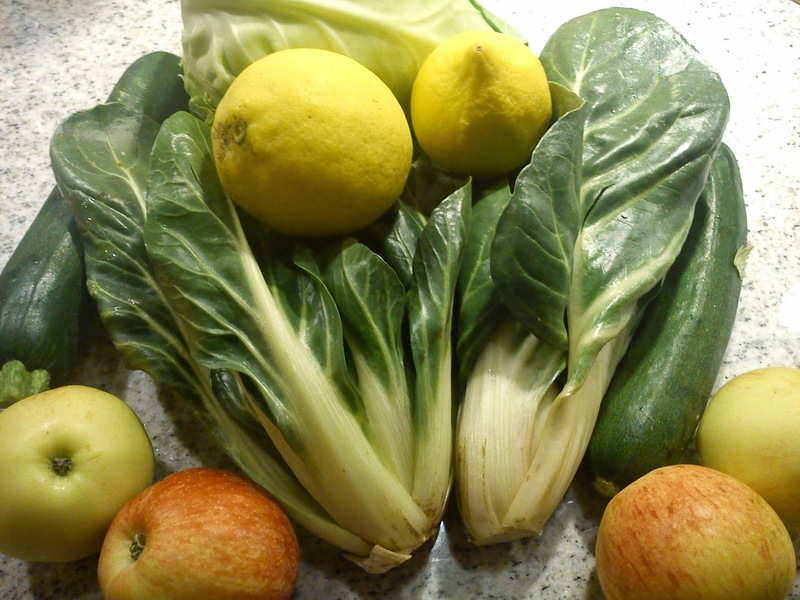 From time to time I need to get to buttom of my weekly vegetable box, making juice is an easy way to use up some vegetable and fruits. 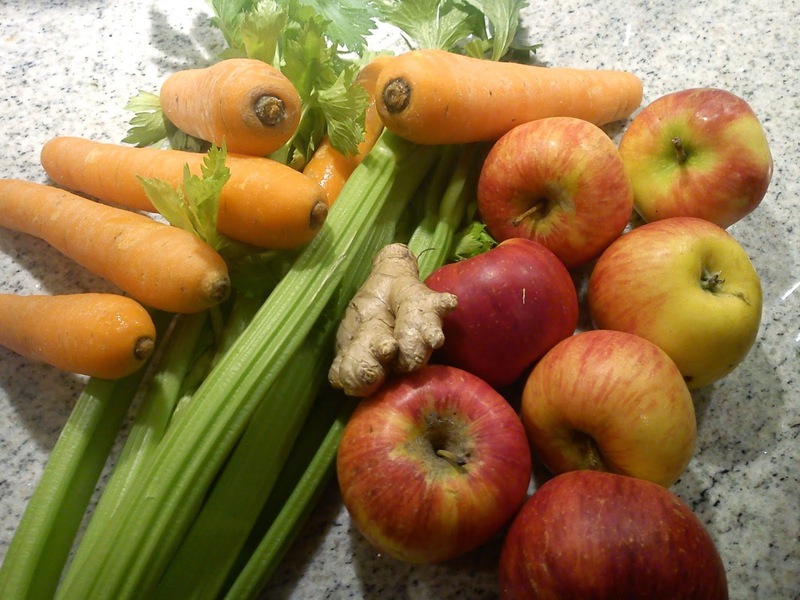 This time I have been twisting this recipe on CARROT LIFT into a more green way by adding in some celery sticks as well. 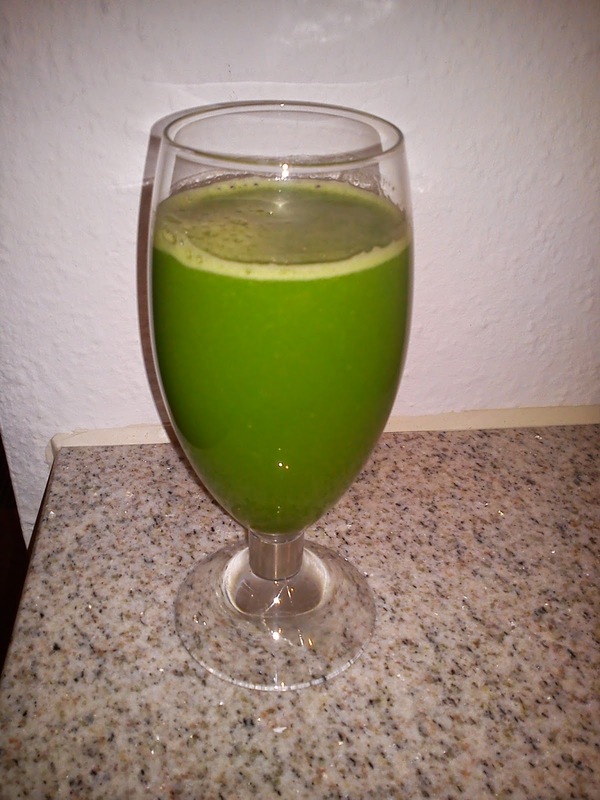 The use of these celery sticks are making the juice less sweet, but the taste is still great. After the massive shopping of vanilla pods together with a group of colleague, I have plenty, let´s repeat plenty of vanilla pods, so you just crab a vanilla pod without even thinking about, when you are busy making cakes or other sweet stuff in the kitchen. 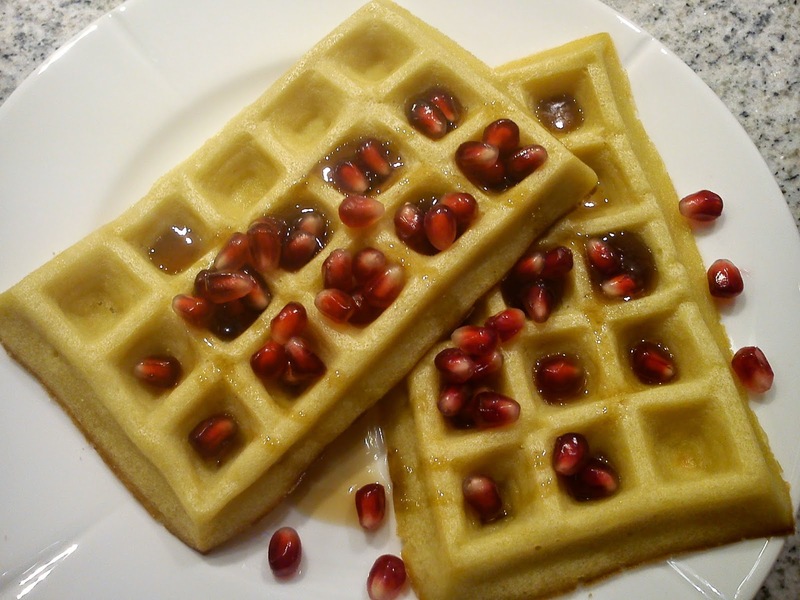 Therefore I decided to turn these sweet waffles into a more luxury version using one vanilla pod. Heat up the (conventional) oven to 220'C. Whip milk and egg together by hand in a mixing bowl. Stir in the melted butter. Remove the vanilla corn from the vanilla pod. Mix in the sugar, so the vanilla corns not are one big mass. Add flour, salt, sugar with vanilla corns and baking powder. And stir everything into a homogeneous mass. Place the silicone waffler forms on a baking tray covered with baking paper. Pour the waffler dough in the silicone forms. Bake the wafflers in the middle of the oven at 220'C for 8-9 minutes. Remove the wafflers from the oven, de-mould the wafflers from the silicone by turning up-side-down and place the wafflers on the baking tray itself. Bake the wafflers with pattern side at 220'C for 6-8 minutes until they turn golden. Serve together with fresh fruit and ahorn syrup. Both taste and texture is excellent. 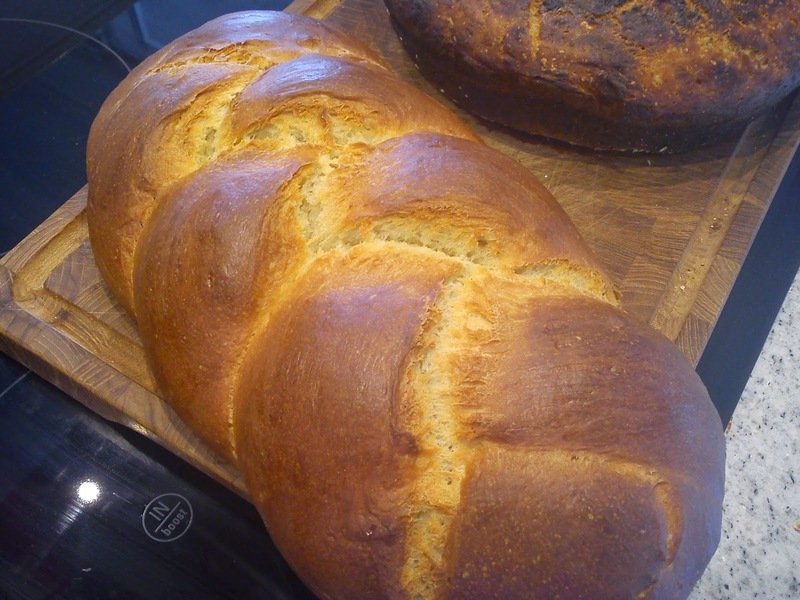 The use of milk and butter in bringing a kind of luxury into the bread. 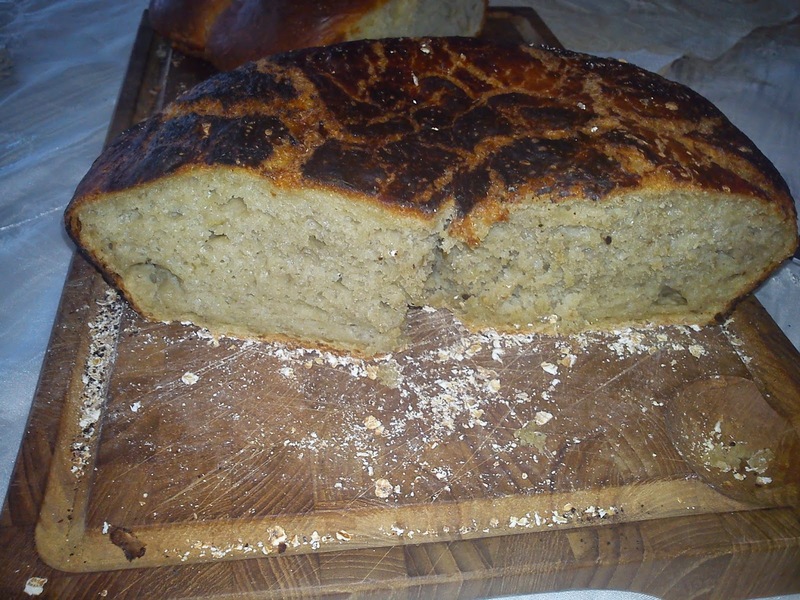 So even two-three days after baking the bread remains very soft in texture. 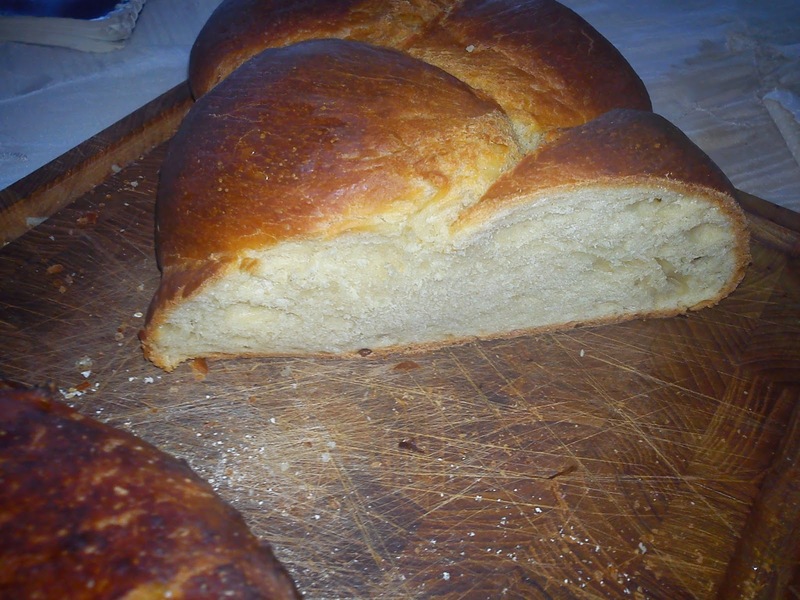 When making the braid of three dough part it is important, that you do not pull to much on the dough. An uneven dough size will give more dry parts in the bread. 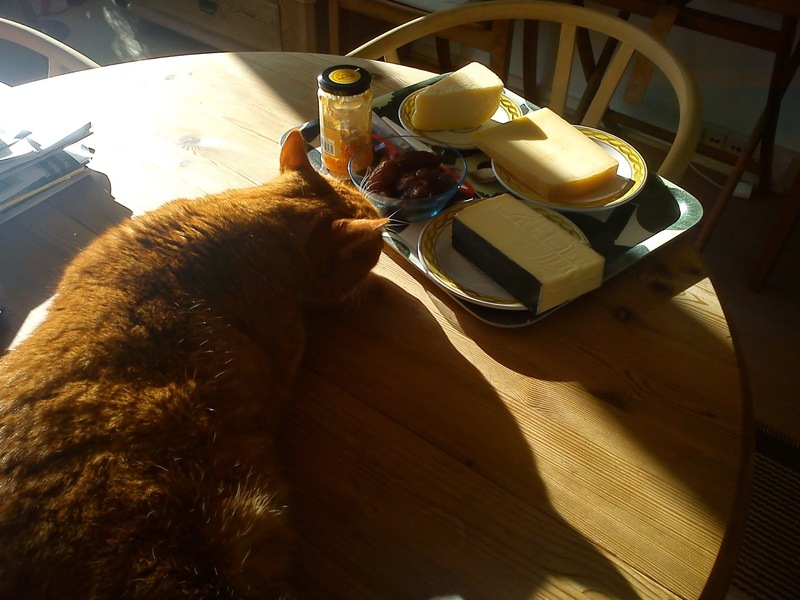 Where is my cheese ? As I have mentioned on several occasions, blogging is for me a way of relaxing my mind from work related things, while it at the same time also means, that I keep on trying out new things in the kitchen, so I have something new to share with you. If you have suggestions to new things, which I could try out in my kitchen, please feel free to leave a comment to this blog post. The ratio between the countries, where you as a reader are coming, seems to have found it´s own stability. 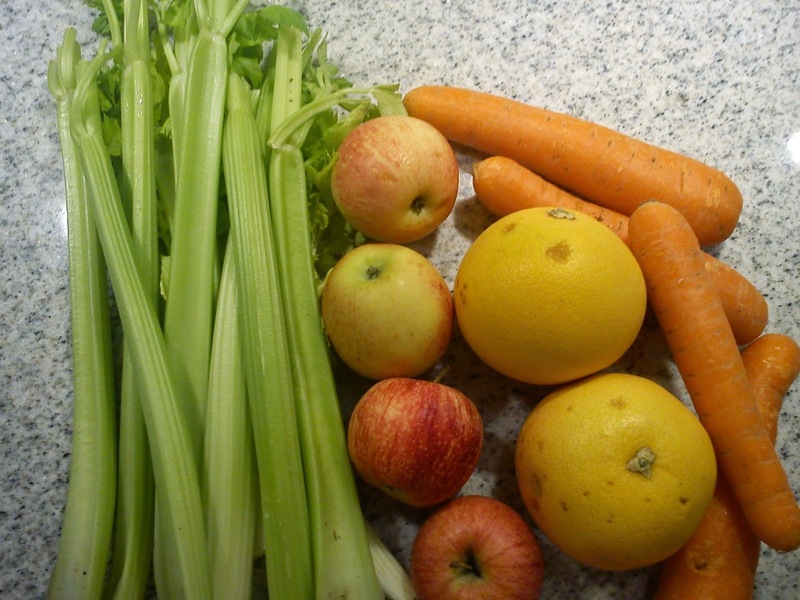 When you are making your own home-made juice, you are at the same time having a lot of juice waste in form of pulp. When possible I added the juice pulp into something. So this time I used the pulp of 9 apples (only the apple part from CARROT LIFT), when I baked this bread using this best bread of the World. It was very interesting to see, how the apple pulp took up the water, when add the water part, and turn the appearance of the water into apple mash !!! 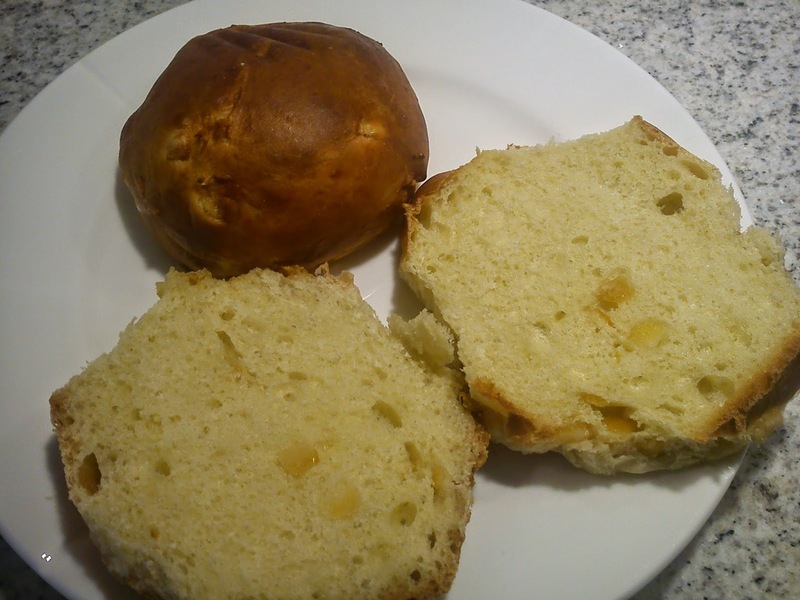 I did expect, that this apple pulp would bring some kind of flavour into the bread, however, I have not noticed in difference in the flavour of the bread. Perhaps the bread is more soggy than usual, so an increase in the baking time of 5 minutes under lid could be an option to avoid this soggy texture. I assume the sogginess is coming from the apple pulp. Stir yeast and water together in a big mixing bowl. Add apple pulp, salt, honey and flour and stir with a cooking spoon. Rise the dough to rise at room temperature overnight - minimum 12 hours. Take the dough out off the mixing bowl, move 1/3 of the dough in over the rest of the dough, keep repeating this process untill you have a small size of the dough. Clean the mixing bowl for any dough leftovers. Place the dough again in a clean miing bowl, ket is rise again for 2 hours. Heat up the cast iron cooking pot incl. lid on a rack in the lower part of the oven at 250°C (fan oven) for ½ hour. Remove the hot cast iron cooking from the oven, remove the lid. Cover the bottom of the cooking pot with oat flakes, as this will prevent the dough from sticking to firm to the surface. Place the dough in the hot cast iron cooking pot, put the lid back on. 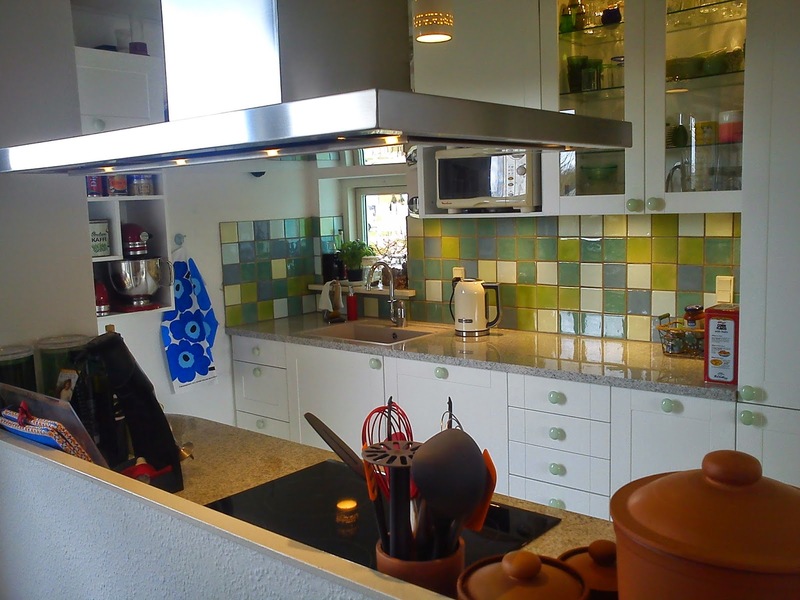 Place the cooking pot in the lower part of the oven, let it bake at 250°C for 30 minutes. 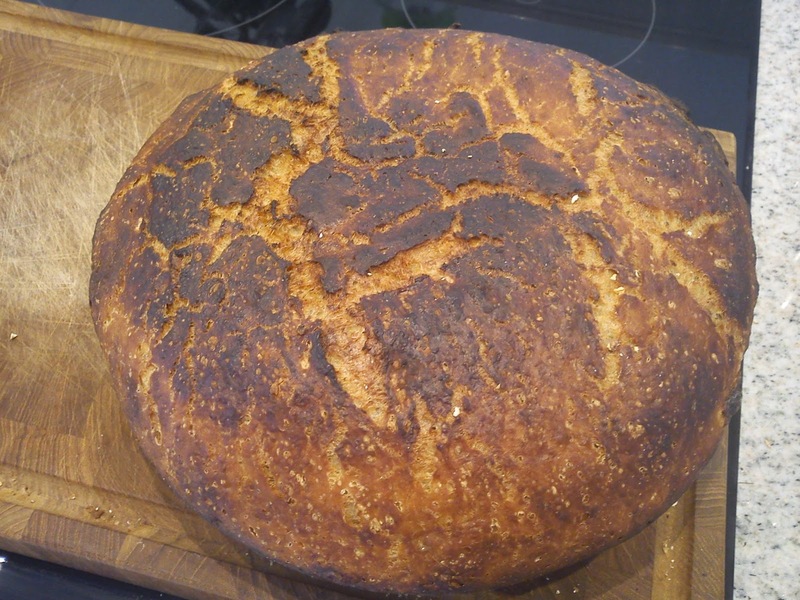 Remove the lid from the cast iron cooking pot, and let the bread bake at 250°C for another 15 minutes. Let the bread cold down on the cast iron cooking pot for 30 minutes. before it is taken out. As a "thank you very much for your time" to my fellow rowers for rowing together with me during the season of 2014, so I once again managed to cross the magic figure of 1500 km required for a "Gold Ore" (actual I rowed 1607 km in 2014), I as usual decided to invite the rowers, who have spend the most time together with me in the rowing boat, for brunch today. Actually if you estimate, that you row 6 km per hour - 1607 km equals 268 hours of rowing last season or 11 days and 4 hours spend in a rowing boat in rain, wind or sunshine. 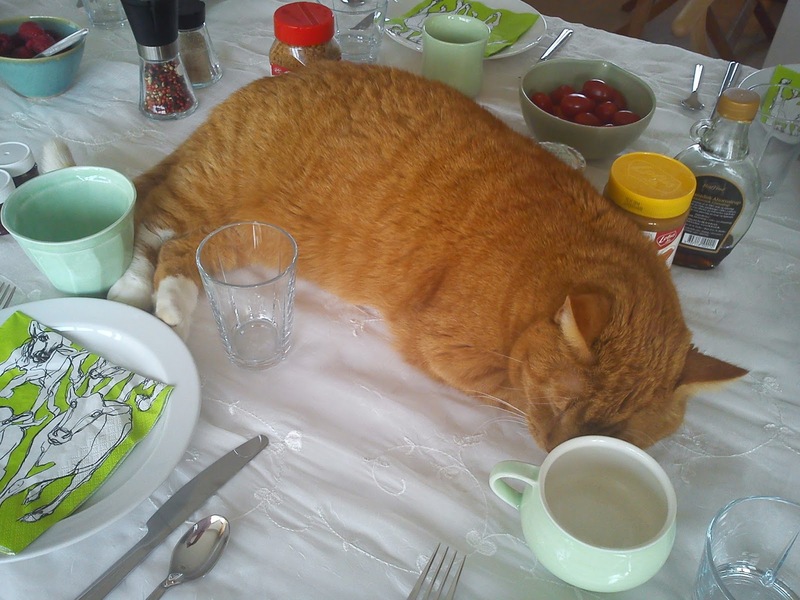 Hannibal as usual decided to take a nap on the dining table among plates, glass, cups and the foods. 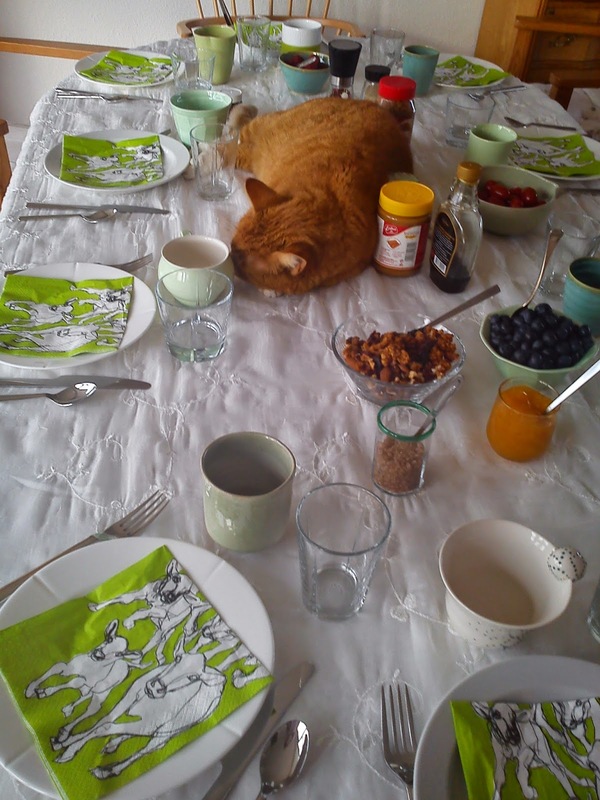 He can actually sleep, even though that I kept putting more and more things on the table !! And for our "sweet tooth" I had baked cookies with raspberry and white chocolate. 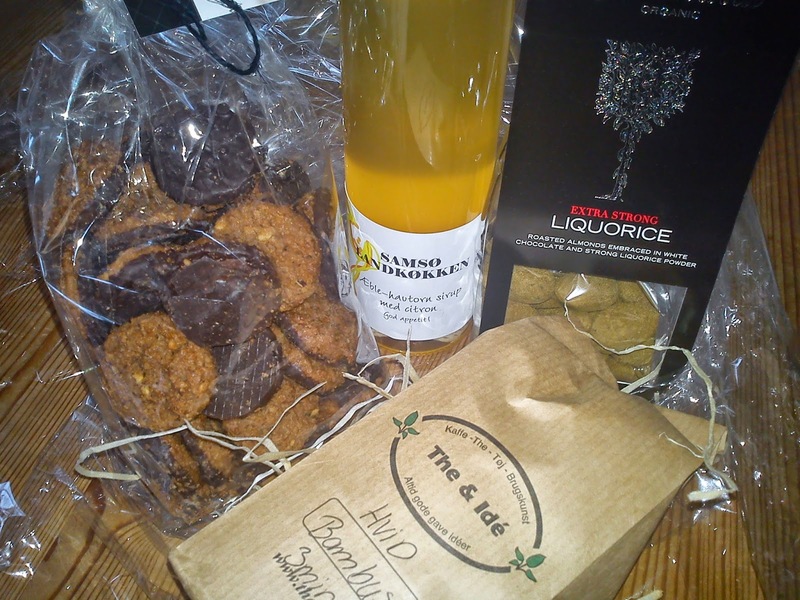 I got some wonderful hostess gifts, which is bringing inspiration to my kitchen as well goes perfect with a cup of tea. When I am travelling through Copenhagen Airport I always buy one cookie as sweet treat, and I always pick the cookie with raspberry and white chocolate :-) So I think it is time for me to make my very own version of these cookies. I have use the cookie dough recipe from these liquorice cookies with cranberries as dough base for these cookies with raspberry and white cookies. You can easily use this cookie dough as a hostess gift, as you can wrap the dough including the baking instruction, so the hostess/host afterwards can bake her/his own home-made cookies. These cookies are being forward for the monthly blogging event Tea Time Treats having the theme of biscuits and cookies. 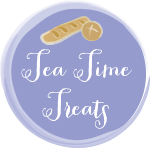 Tea Time Treast is managed by Karen from Lavender and Lovage and Jane from The Hedge Combers. Sieve the wheat flour and baking powder in the mixing bowl. Add in the salt and butter squares. Mix on KitchenAid using the K-spade on speed 3-4, until the butter has disappeared into the cookie dough. Add in the sugar, eggs, white chocolate and raspberry. Mix until the cookie dough just gathers. Over mixing will give cookies with less crispness. Divide the dough into 3 portions of 500 g each. Roll the cookie dough into longer strings. Cover each cookie string in baking paper. Place the cookies dough cold, either in the refrigerator or freezer. Cut the firm cookie dough into slices of 1 cm. Place the cookies on a baking tray covered with baking paper. Bake the cookies in the upper part of the oven at 190'C for 8-10 minutes. 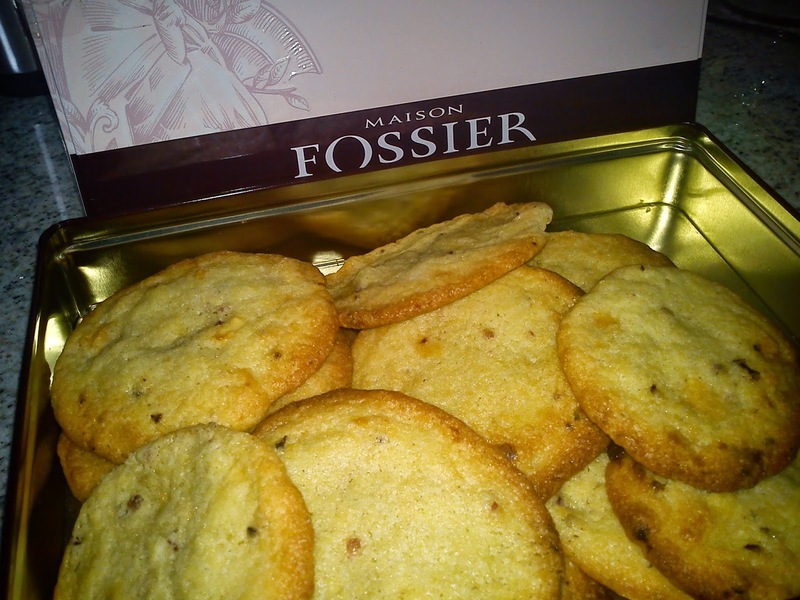 Cool down the cookies, before storing them in airtight containers. The name of this juice is not fitting according to my taste buds !!!! 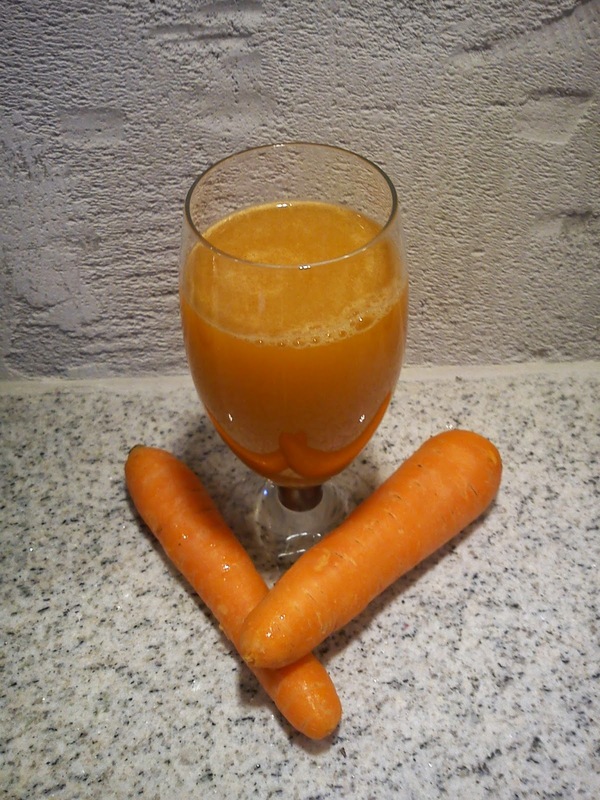 SWEET CARROT and the taste profile is more in the bitter direction due to the use of grape fruits !!! Well I managed to drink the juice, while I was thinking positive thoughts about the health benefits of grape fruits !!!! My sofa cushion is finished and ready for use in my library. Here I am slowly transforming the color scheme from purple/red into mainly green. So a transformation can easily end up with costing a fortune, so I am on approachint this task with a cost optimisation view point !!! such as knitting a sofa cushion myself. I have spend 238,50 DKK on wool yarn and 100 DKK on the pillow (with real feather inside ! ), so a total of 338,50 DKK in material. You can not buy a lot of sofa cushion for this amount of money in Denmark. Here you easy end up spending 500-700 DKK for designer/brand cushion. 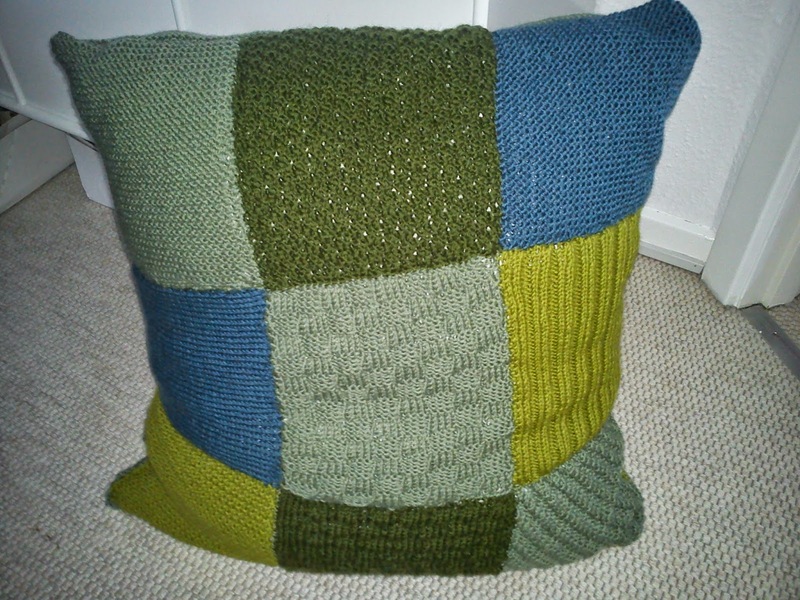 I have also located an almost brand new HAY sofa cushion in green on second hand internet site from 300 DKK instead of 570 DKK. And a older plaid from the living room has been moving into the library as well to function as bed cover. Now I am the process of finding some one at work, who can operate a sewing machine, as I have some fabric brought on a business trip, which should be turned into bed linens "containers" for storage of extra duvets and pillows. Using butter in a bun dough brings in my opinion a sensation of luxury to the bun. I am getting more and more attracted to use butter in buns, when you are kneading unmelted butter into the dough as the last stage of the kneading process. If you do not like sucat, you can just remove it and perhaps replace it with 100-150 g raisin, if you like raisins. I used 100 g sucat in these buns, and in my opinion you could easily increase the amount to 150 g sucat. I have also been thinking about using some strong black tea as part of the liquid. I will for sure share such a recipe with you later on. Pour milk and water in the mixing bowl of the stand-alone mixer. 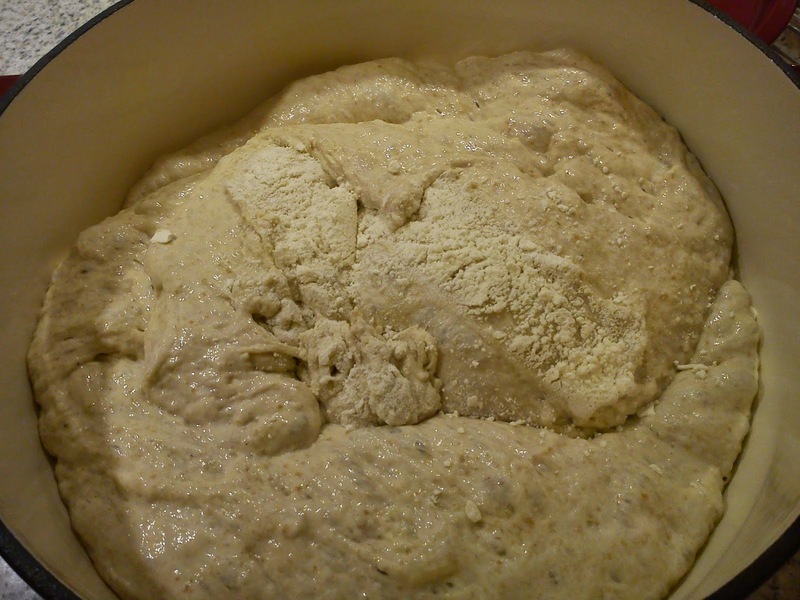 Dissolve the yeast into the yeast into this liquid by stir with a spoon. Weigh salt, sugar, sucat and eggs into the liquid. Knead these ingredients together on the mixer at speed 2 for 1 minute. Add in the flour into the mixing bowl. Knead the dough together for 2 minutes at speed 2 followed by kneading it at speed 4 for 6 minutes. Add in the butter squares. Knead the butter into the dough at speed 4 for 2 minutes. After kneading let the dough stand warn for 2 hours with the tea towel covering the mixing bowl. Divide the dough into bun portion of 80 g. Place the buns on baking trays covered with baking paper. Cover the buns with tea towels, and let the dough raise for another 1 hour. Heat up the fan oven to 200'C. Bake the buns in the fan oven at 200'C for 12-15 minutes. 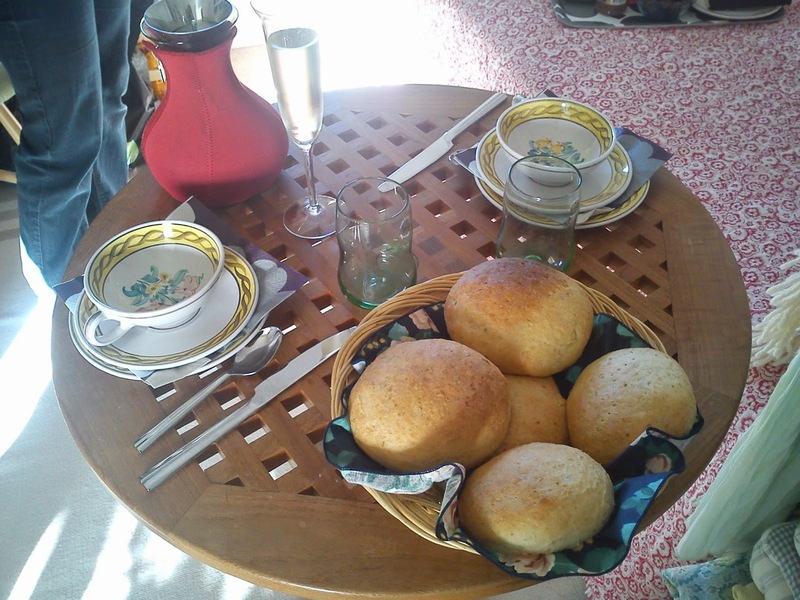 We started off with some great tasting and very airy tea buns, which served a base for various cheeses and jam and several cups of black tea. 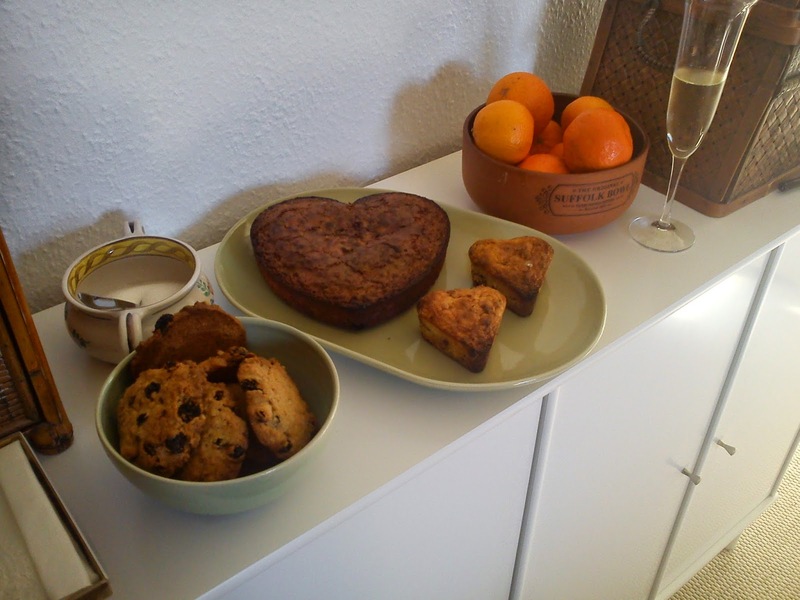 The sweet part of the afternoon tea was Valentine´s blondie and oat cookies. It is so sure not the last time, that I will be serving afternoon tea in the library. 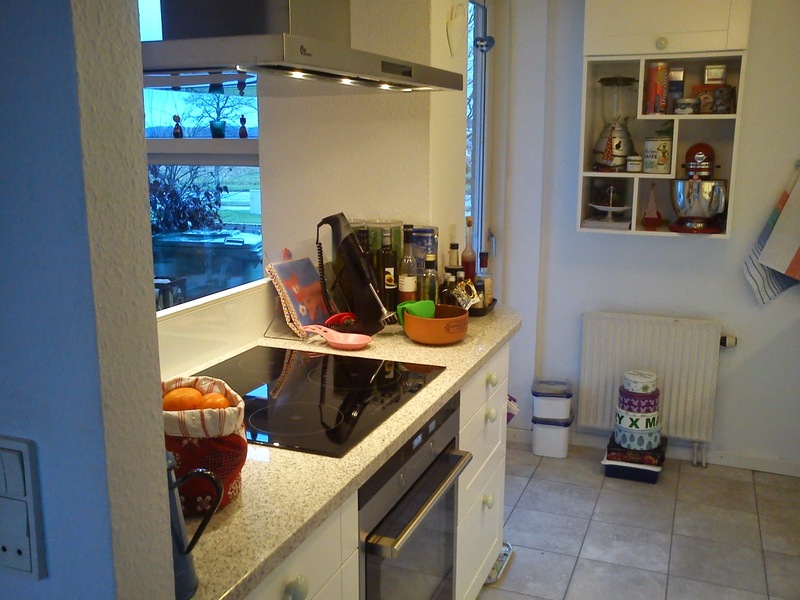 Here 3½ months later on I am still enjoying my new kitchen to the full. 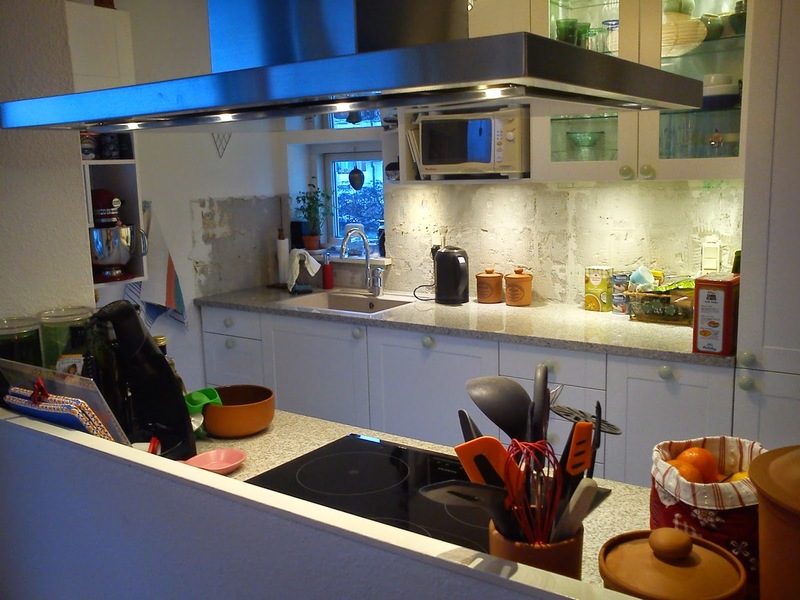 The last permanent tabletop was delivered in mid-December, which also brings extra light into a north-facing kitchen. And shortly before Christmas a piece of clear glass with white back ground was placed on the half wall behind the stove. During this Winter I have really appreciated all the light available in my kitchen. Suddenly there is light everywhere, so there is no longer any dark corners. The means, that I suddenly have much more energy to do various things in the kitchen even on a weekday evening besides from just an easy dinner. How I love to have stove with induction, where the temperature regulation is so imediate. Water for boiling paste is quickly send to the boil point using the booster function, add the paste, then lower the the temperature easily, when the water is boiling again. This means that I no longer have any problems with the pasta boiling. On the other hand the oven and I are still learning to live together ! The usual baking times for cakes and muffins from tested and trsuted recipes do not match anymore in the new oven. The old oven must be baking at higher temperatures than my new oven. So either I have to increase the baking time or raise the oven temperature by about 20'C for get "the usual" baking time !!! And why do you "only" get delivered ONE baking plate with edges and a roasting pan, when you buy a fan oven !!!! The advantage with fan oven should precisely be that you can bake 3 plates of muffins or cookies at once !!!! How is this possible, when only supplied ONE baking plate ?And the design of the baking plate !!! Why is baking plate not flat ??? It is very difficult just to pull a piece of baking with cookies from the tabletop to the baking plate. It can "only" be a man who has been involved in this !! I mean selling a fan oven with ONLY one baking plate !!!! At some time I will get around to actually read the manual for the new oven. The oven has certainly significantly more features than I can figure out by turning and pressing the oven buttons. The features are ihverfald not self-explanatory by turning the buttons !!! Again my good neighbor has been helping me by putting up some new lamps in my kitchen. 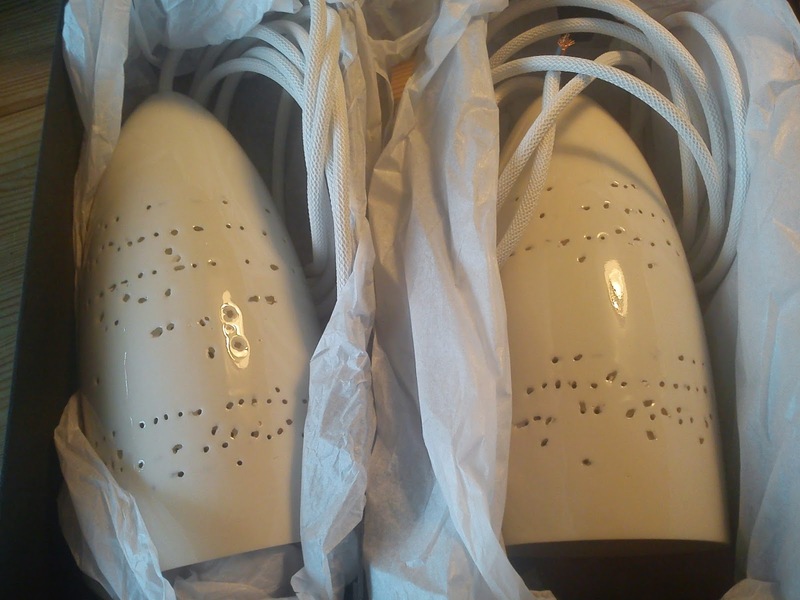 I saw some ceramic lamps at the Christmas Fair at Trapholt, which I when was so luckily to get a Christmas present. What I really like about these ceramic lamps is that the holes in the lamp form a pattern of light on thall that could remind about lace pattern. 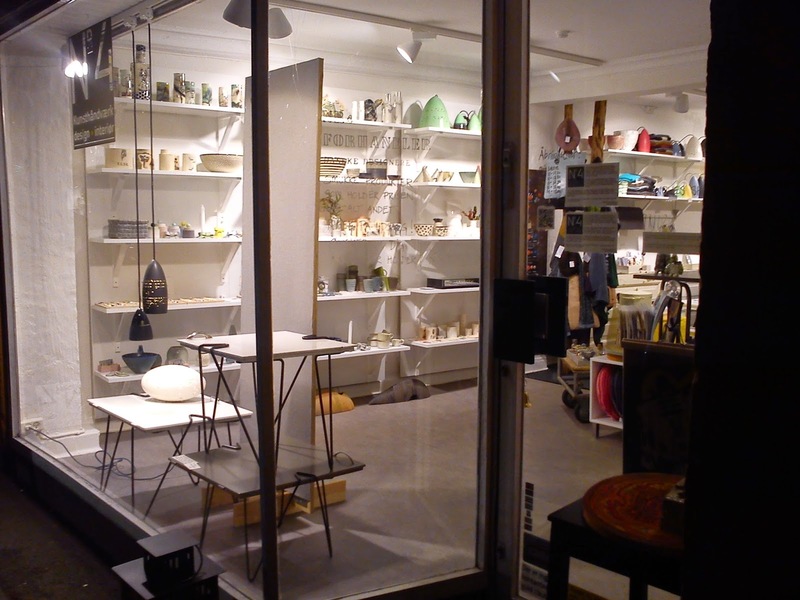 The lamps are made by Helenaa Hedegaard. 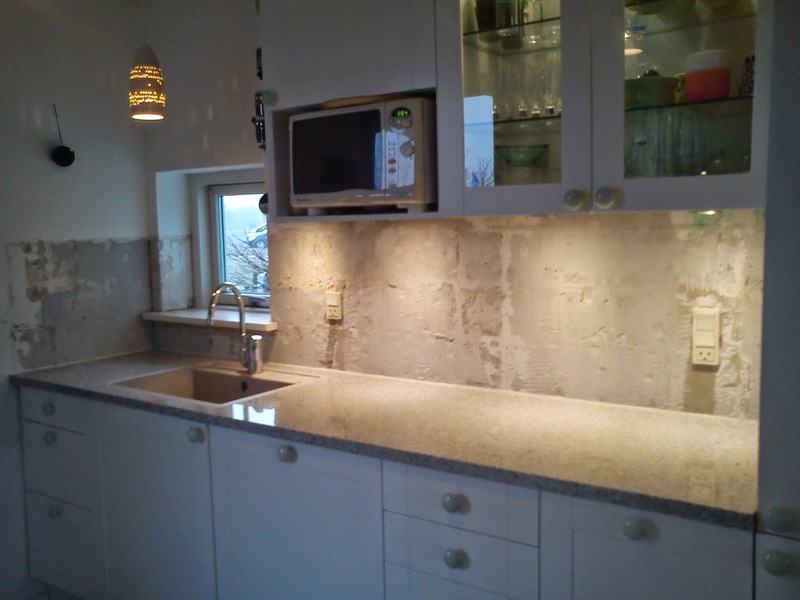 I am getting closer and closer to finishing line for my kitchen project. 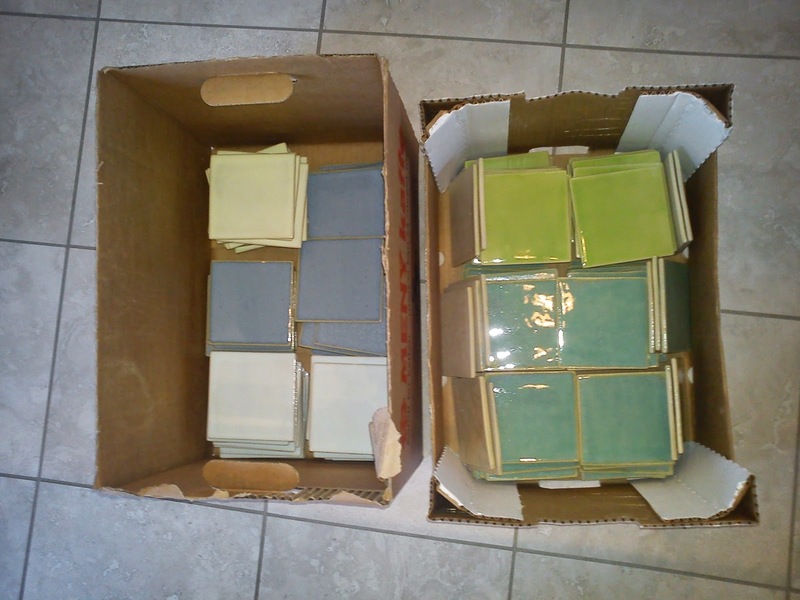 Today I will be picking up the long-awaited ceramic tiles at the ceramist. And then I start to do my best to control the bricklayer trying to get a tight grip of his calendar !!! Setting up the ceramic tiles on the wall around the wall cupboards. So here I am still living with a "cool look". Her 3½ måned senere nyder jeg stadig mit nye køkken i fulde drag. Den sidste blivende bordplade blev leveret midt i december, hvilket ligeledes bringer extra lys ind i et nordvendt køkken. Og kort før jul fik jeg sat et stykke klar glas med hvid bagkant på halvvæggen bag kogepladerne. Her i vinterens løb har jeg sat utrolig meget pris på alt det lys, som jeg har fået ind i mit køkkenet. Pludselig er der lys overalt, så der ikke længere er mørke kroge. Det betyder konkret for mig, at jeg har fået energi til at lave diverse ting i køkkenet selv på en hverdagsaften udover bare nem aftensmad. Og hvor jeg dog elsker at have fået kogeplader med induktion. Temperatur reguleringen er spontan. Vand til pasta koges hurtigt op med booster funktion, pastaen kan tilsættes, hvorpå temperaturen nemt kan reguleres ned, når vandet koger på ny. Det betyder, at jeg ikke længere har alle de problemer med pasta, der koger over undervejs. Til gengæld så kigger min ovn og jeg stadig hinanden an. De sædvanlige bagetider for kager og boller passer fra gennemprøvede opskrifter stemmer ikke overens mere i den nye ovn. Den gamle ovn må have bagt ved højere temperatur end min nye ovn. Så enten skal jeg øge bagetiden eller hæve ovn temperaturen med ca. 20'C for at bagetiden stemmer sammen !!! Og hvorfor får man "kun" leveret EN bageplade med kanter og en bradepande, når man køber en varmluftsovn !!!! Fordelen med varmluftsovn skulle jo netop være, at der kan bage 3 plader boller eller småkager ad gangen !!!! Hvordan er det muligt, når der kun leveres EN bageplade ? Og udformningen af bagepladen !!! Hvorfor er bagepladen ikke flad ??? 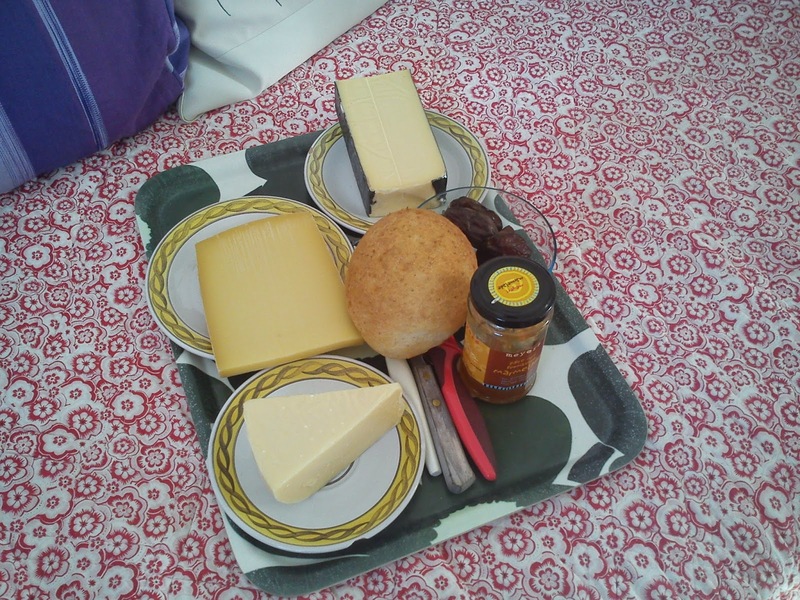 Det er blevet besværligt lige at hive et stykke bagepapir med småkager overpå bagepladen fra bordpladen. Det kan "kun" være en mand, der designer ikke-flade bageplader og kun levere EN bageplade til en varmluftsovn !!!! Ved lejlighed får jeg sikkert læst brugsanvisningen igennem for den nye ovn. Ovnen har sikkert væsentlig flere funktioner end jeg kan gennemskue ved at dreje og trykke på ovnens knapper. Funktionerne er ihverfald ikke selvforklarende ved at dreje på knapperne !!! Min gode nabo har endnu en gang været forbi og sætte nye lamper op i mit køkken. Jeg har så nogle keramiklamper på Trapholt julemarked, som jeg så ønskede mig i julegave. Det jeg rigtig godt kan lide ved disse keramiklamper er, at hullerne i lampen danner et lysmønster på væggen, der kunne minde om knipplingmønster. Lamperne er lavet Helenaa Hedegaard. Nu nærmere jeg mig afslutningen på mit køkkenprojekt, idet jeg skal afhente de længe ventede keramikfliser i dag hos keramikeren. Herpå kan jeg atter tage fat på mureren og en stram styring af hans kalender !!! Opsætning af keramikfliser på væggen omkring overskabene. Så her lever jeg med et "råt look". 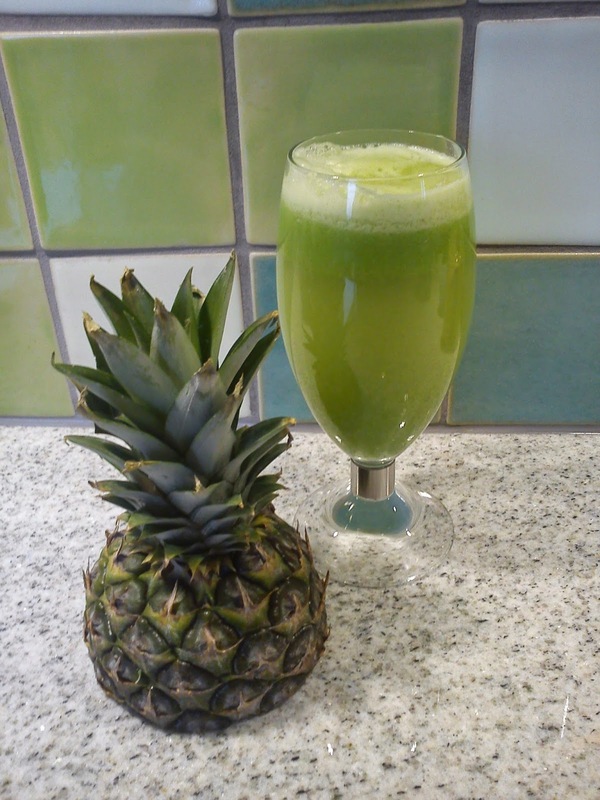 This juice both looks and taste healthy !!! The colour is very grass green, while is taste of cabbage to the the bitter side. 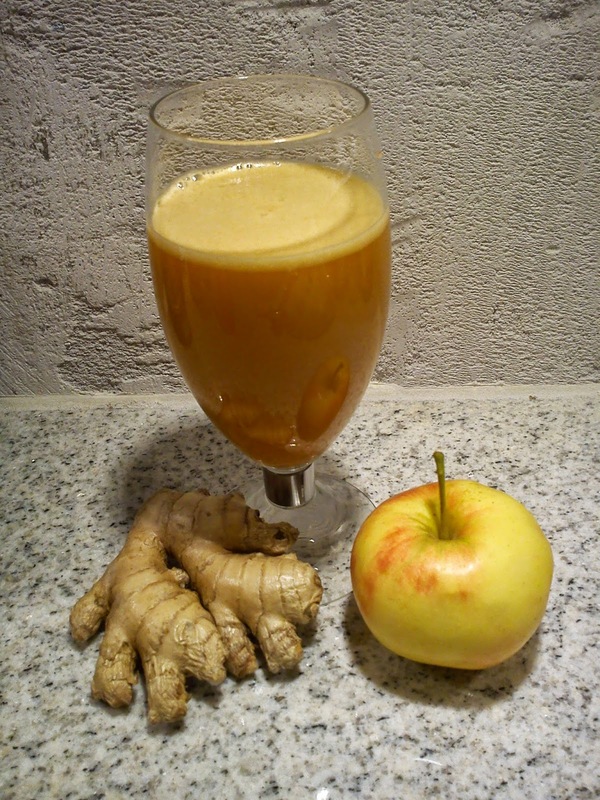 I do not think, this juice will become of favourite of mine with it´s "healthy" taste. It is a good idea, not the juice the lemon incl the peel, as this will increase the bitterness to an unpleasant level. Juice the lemon between the apples. After being busy in my kitchen, I decided to continue my "decoration work", while I still are waiting for the kitchen wall tiles to arrive as finishing touch in my kitchen. So fare a spare bedroom in the house has been used as guest bedroom, which very easily is turned into a storage room, when there is no guests !!! So more a room, where you close the door firmly !!! 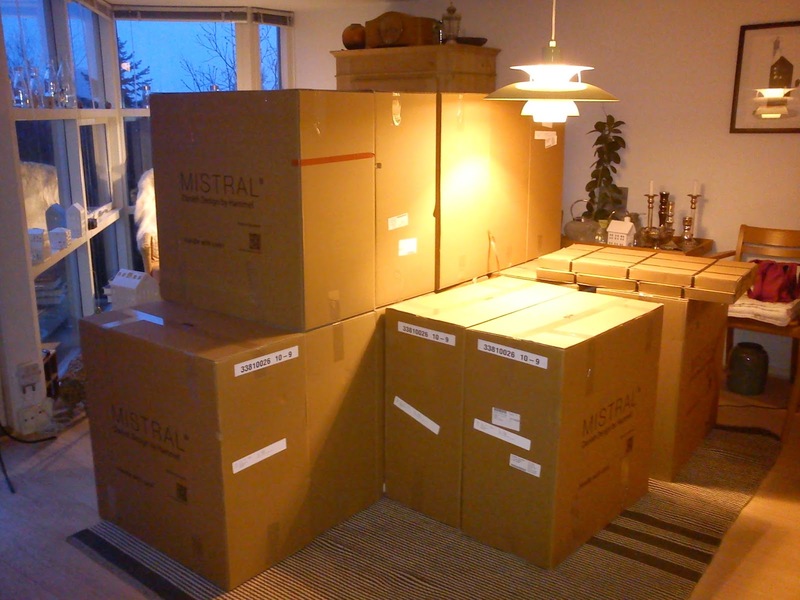 In connection with usual sale around New Year, I saw that the price on Mistral shelving system was reduced with 35%. 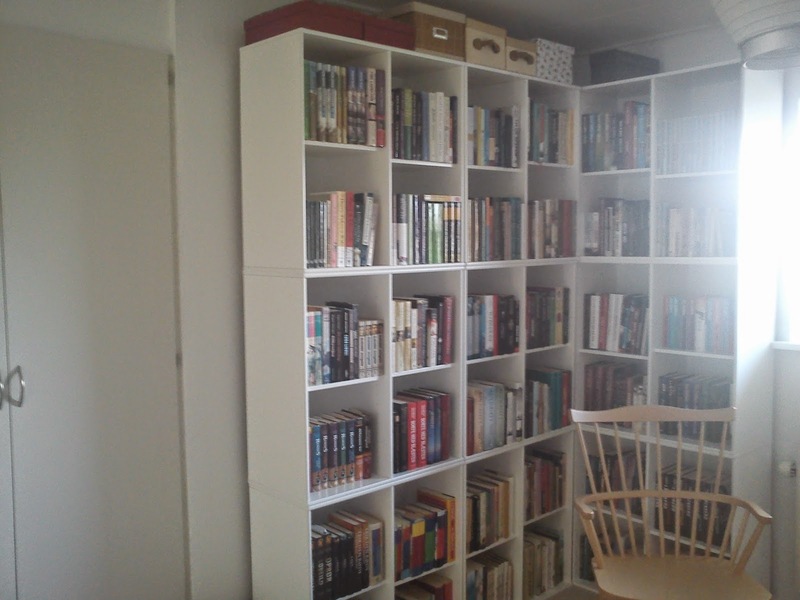 So quickly I got the guest room measured up, calculated that I could fit in 15 bookcases !!!! 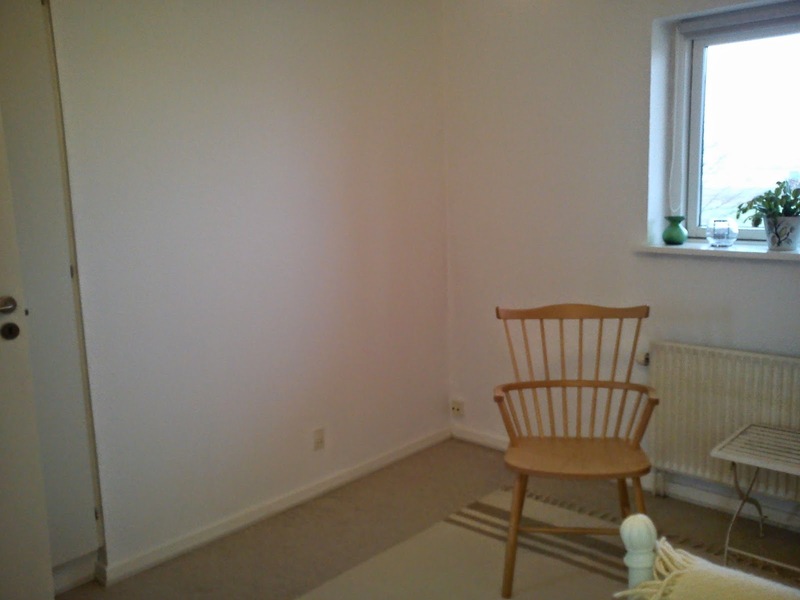 After the shopping at the furniture store I went shopping for some white paint, so I could paint the entire room - walls, ceiling and panels. All the details, where you put up the painting tape and cover the floor with cardboard paper always feel like taking for ever, before you can get on with the actually paint work. 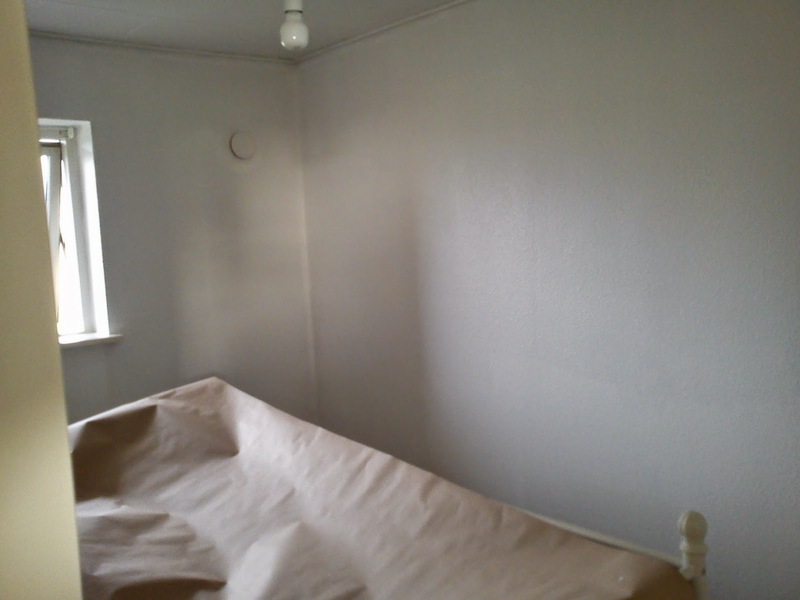 When you are using a paint roller, painting the big surface basically takes no time to turn into a refreshing new look. 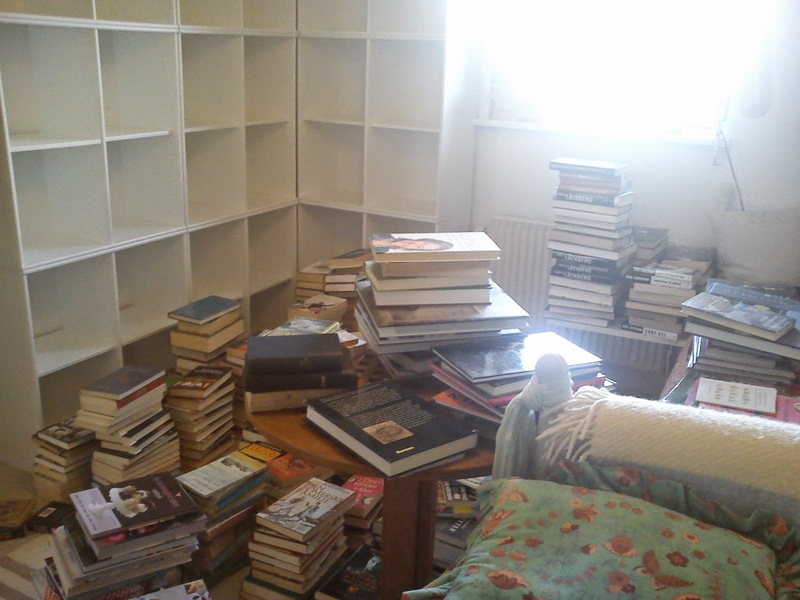 A week after the shopping all the many book shelves arrived, so yet again the floor in my living room was full with cardboard boxes. 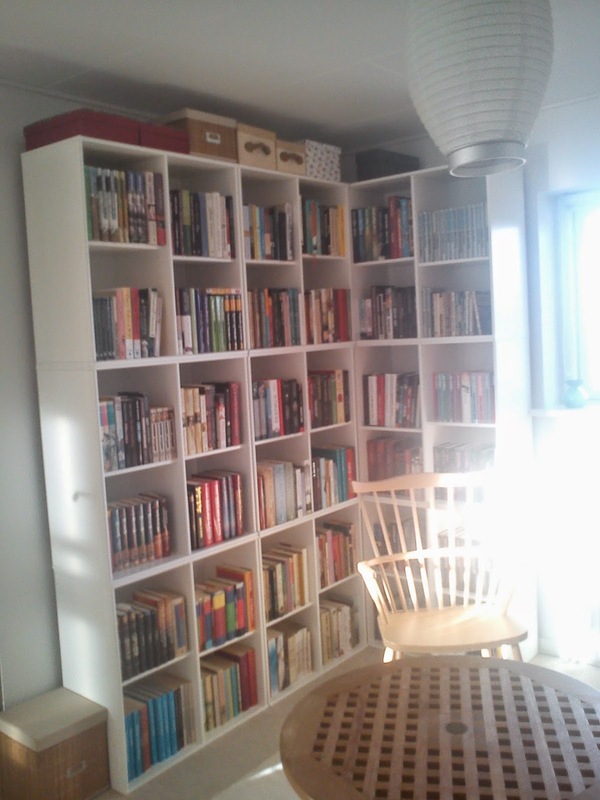 So I spend a Friday evening releasing the many book boxes and caring them upstairs. The day after I could continue by filling up the entire floor with all my many books, grouping them in theme or by author in alphabetical order. I ended up with the themes like crimes, cooking books, travelling guides, children book from my childhood, biography, specific themes of Jane Austen and Harry Potter (in original language !). I still have a bed in my library, so guests staying over still has a bed to sleep in :-) Both Hannibal the Car and I are now enjoying to spend time in the fantastic room, I am reading on one end of the bed, while the garden lion is taking a nap in the other end. 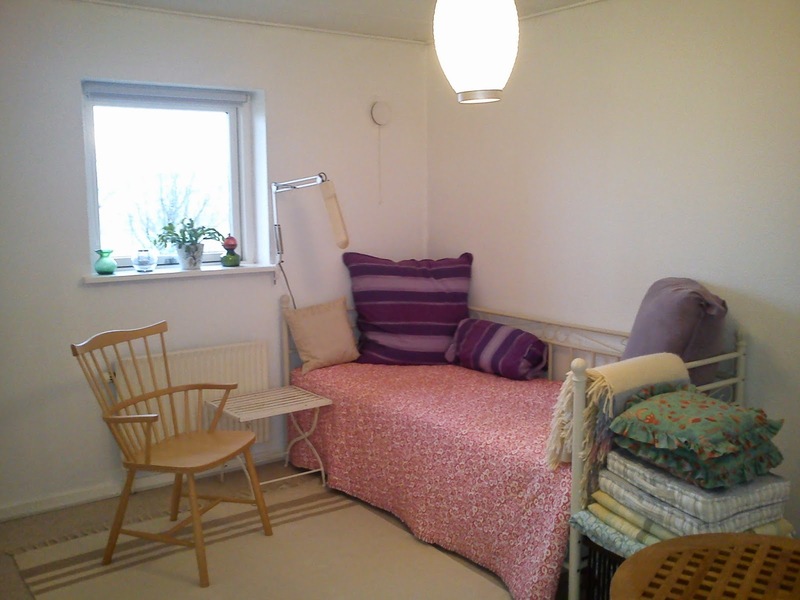 The next plan for the room is to change the colour from purple/red into mainly green, so I am looking for some new sofa cushion and a new bed blanket in various shops. This part of the process can easy ends up costing a fortune, so lets see, if I can find a less expensive solutions such as knitting a sofa cushion myself or ?? ?